Featured Contributor Nusrat Qadir shares her opinion on the Supreme Court ruling against Abercrombie & Fitch and judging women based on their appearance. In 2006, clothing retailer Abercrombie & Fitch dealt with their CEO Mike Jefferies discrimination towards “fat and ugly kids” wearing the company’s clothing. Despite the CEO’s mea cupla stating that his company is opposed to any discrimination, Abercrombie & Fitch found themselves again in the midst of a discrimination against a 17-year-old Muslim female they refused to hire. In 2008, Abercrombie and Fitch denied employment to Samantha Elauf because she wears the Muslim headscarf known as the hijab. The company’s policy prohibited wearing of any kind of head covering forcing Ms. Elauf to take her discrimination case all the way to the Supreme Court. Thankfully, the Supreme Court ruled in favor of Samantha Elauf, thus allowing her to work without sacrificing her modesty as prescribed in Islam. But this monumental ruling is more than just about the right to wear religious attire at work. This decision also touches upon the sensitivities of female appearance at the work place and how society continues to scrutinize women based on their appearance. Recently, the worldwide spiritual leader of the Ahmadiyya Muslim Community, the Khalifa of Islam, His Holiness Mirza Masroor Ahmad, spoke on the hijab stating, “the hijab actually establishes true dignity, independence and freedom of women.” In a society that emphasizes female competency based on their hairstyles or the right pantsuit, donning a hijab for Muslim women has been a solution to even the playing field. The hijab allows employed Muslim women to be recognized for the value they bring to the work place, rather than solely being judged on appearance. The latest Supreme Court ruling is a big win for people who wear religious clothing. Samanatha Elauf’s case highlighted that regardless if a woman covers her head or not, women continue to fight for equality in the workplace. According to a recent United Nations report, women earn 24% less than men even in female dominated fields such as nursing or teaching. And when it comes to employee appearance discrimination, Hollywood has been a prime example demonstrating that women have an early end date for when they are considered employable, even if they are Academy Award Oscar nominated actresses. Abercrombie & Fitch’s past statements regarding their customer’s appearance gave insight to perhaps how they viewed their employees as well. By not hiring Samantha Elauf, the company displayed not only their discrimination towards religious attire, but also towards preconceived notions of acceptable female appearance. The Supreme Court ruling upholds the American value of freedom of religion and enables hijab wearing Muslim women a fair opportunity to earn a living. This ruling also makes a statement about the right for all women to be valued beyond appearance, a fact that companies and countries worldwide are now forced to recognize. The hijab discrimination lawsuit served as a statement to society indicating that women should not be subject to being hired based on their appearance. And while society may continue to struggle with the purpose of the hijab or equate it with oppression, this historical Supreme Court ruling has shown that the hijab serves as a symbol of equality and empowerment for all women in the workplace. 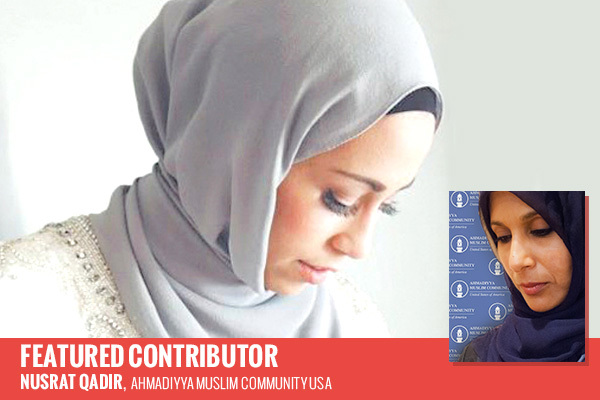 Nusrat J. Qadir works with the Ahmadiyya Muslim Community on issues related to Islam. She is also a neonatal intensive care unit registered nurse. Nusrat can be found on Twitter @njqrn.